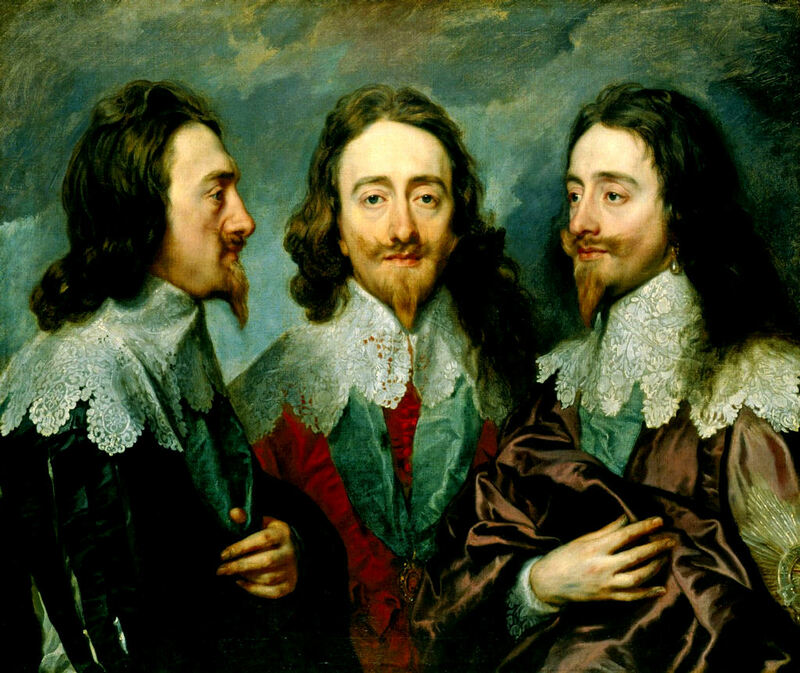 Two things turned my attention to triple portraits: a student essay on Renaissance portraiture as an expression of humanism, and the anniversary (today) of King Charles I’s accession to the thrones of England and Scotland in 1625. I was inspired to look (again) at one of my favorite portraits of the Stuart king, the one and only victim of regicide at the close of the English Civil Wars, and to explore the origins of the subgenre of triple portraiture, yet another Renaissance invention. 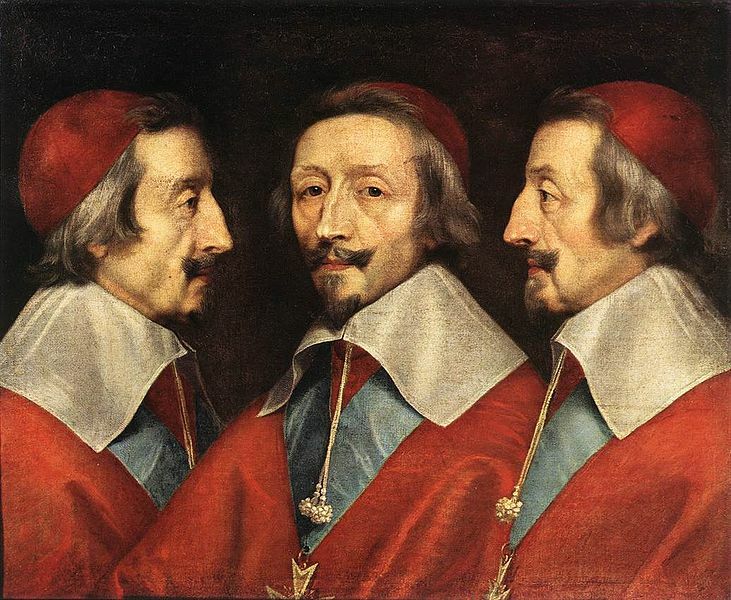 The famous Van Dyck portrait of Charles, painted in 1635 as a study for a marble bust by Lorenzo Bernini, was both influenced by an earlier composition and influential to a future one: Lorenzo Lotto’s Triple Portrait of a Jeweler, the first triple portrait, was in the King’s collection at the time, and across the Channel, Cardinal Richelieu, l’eminence grise, was inspired to have his own triple portrait painted shortly thereafter. Anthony Van Dyck, “Charles I in Three Positions” (1635), Royal Collection, London; Lorenzo Lotto, “Triple Portrait of a Jeweler” (c. 1530), Kunsthistorisches Museum, Vienna; Philippe de Champaigne and studio: “Triple Portrait of Cardinal de Richelieu” (1642), National Gallery of Art, London. It is interesting that Lotto’s portrait is of an anonymous jeweler, or goldsmith, rather than a “great” man like King Charles or Cardinal Richelieu. It is also more realistic and less impressionistic, and Lotto’s quest for the absolute essence of the jeweler (one perspective is not enough) ultimately gives him more dignity than either the King or the Cardinal, in my opinion. Or it might just be that I know much more about those two! 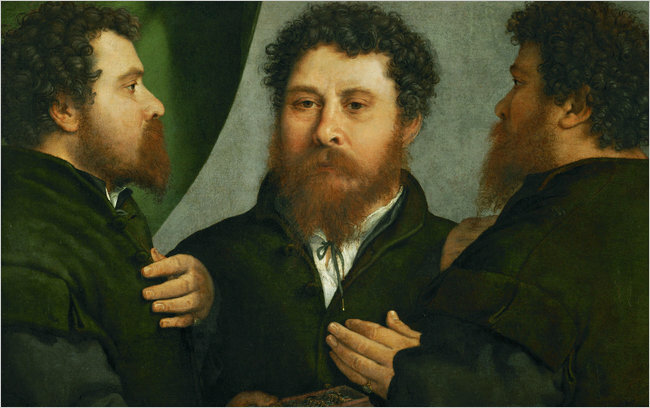 There is another sixteenth-century triple portrait that I want to include here even thought it’s a bit different–in several ways. It is not like the others in that it is a portrait of three different people, rather than just one person in different “positions” (to use the language of the day), although the artist is definitely playing up their similarity. And appearances are very deceiving in this collective portrait: these profiles do not belong to women, but rather to rather fancifully-dressed (and -tressed) men: the “favorites” of French King Henry III (1551-1589). 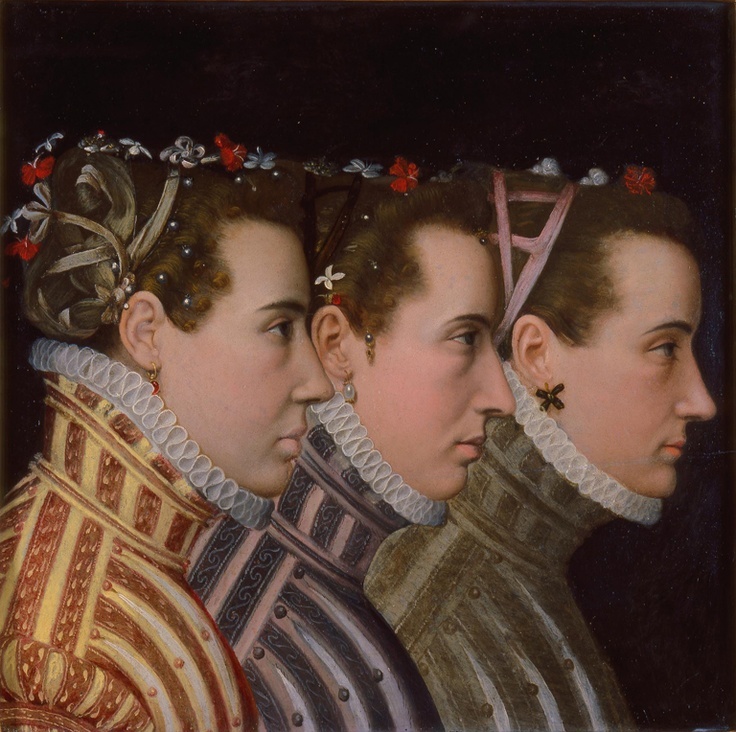 “Triple Profile Portrait” (c. 1570). Attributed to Lucas de Heere (Ghent, Belgium, ca. 1534–ca. 1584), Milwaukee Museum of Art. The triple portrait technique has been used intermittently in the succeeding centuries, to depict both single and collective subjects: the Van Dyck portrait, in particular, has been copied and adapted numerous times, most recently by Hip Hop artist Kehinde Wiley–it really has a life of its own. Norman Rockwell rendered his own self-portrait in triplicate, and also that of Lyndon B. Johnson. Andy Warhol liked the multiple portrait, of course, though went for mere duplication rather than divergent profiles. 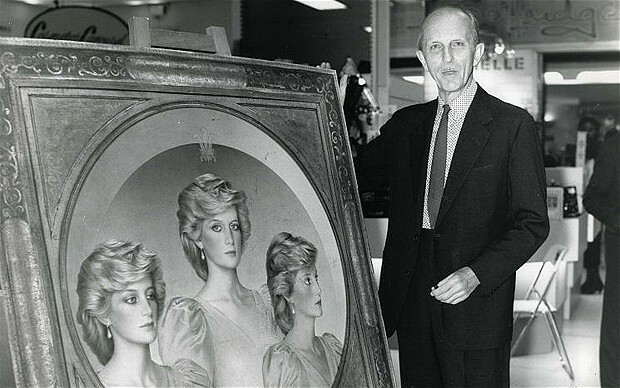 And to return to royal portraiture (at least another kind of royalty): there were official triple portraits made of both Prince Charles (for the occasion of his 60th birthday) and Princess Diana (in 1987). The latter portrait hangs at Cardiff City Hall in Wales, and was apparently hastily (and temporarily) removed upon the occasion of a visit by Charles and his present wife, Camilla, the Duchess of Cornwall, in 2005. Just to avoid an awkward “encounter” of sorts. 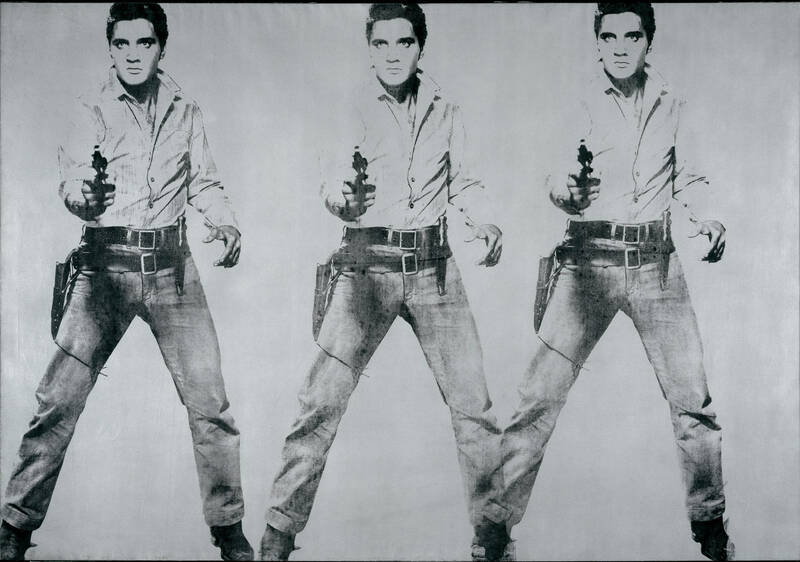 Andy Warhol, “Triple Elvis” (1963), Fisher Collection, San Francisco Museum of Modern Art; the portrait painter John Merton (who died just last month) with his triple portrait of Diana, Princess of Wales in 1987. Photo: UPPA/PHOTOSHOT. This entry was posted on Wednesday, March 27th, 2013 at 6:22 am	and tagged with Art, Renaissance, Royalty and posted in Culture, History. You can follow any responses to this entry through the RSS 2.0 feed. I was going to make a joke about these days we call them mug shots, until I seen Elvis! And when I was a senior in high school (many more years ago than it’s polite to count), one of the options the class photographer gave us for our senior photo was a triple portrait photo with a large picture of our face surrounded by two smaller pictures taken from different angles. Reblogged this on The Keystone Journal.